Katie will be on campus to share her career path with students in a Fireside Chat Q&A format. 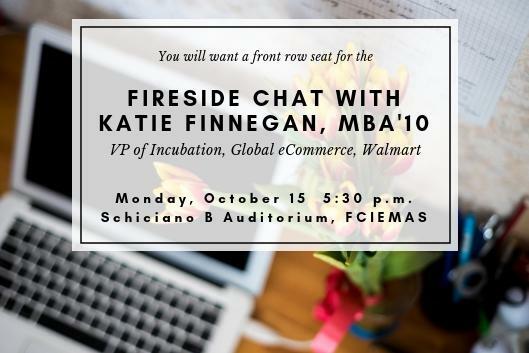 As Vice President of Incubation for Walmart.com and Jet and Founder and Principal of Store No 8, Katie Finnegan brings a passion for retail and entrepreneurship to incubation. From sitting in on conference calls starting at age 8 with her retail executive dad, to early days in merchandising with J.Crew, to co-founding an innovative retail tech startup, Katie has always had a passion for retail and building. Prior to her role as VP of Incubation, Katie was Head of Corp Dev, IR and Strategy for Jet, reporting directly to CEO Marc Lore. Katie joined Jet in 2014 with the acquisition of Hukkster, the retail tech start-up she co-founded in 2012. The transition from a strategic role at Jet to a leadership role is a natural progression for Katie. A recent transplant to San Francisco from NYC, you'll find Katie cruising around town in her powder blue 1980 International Scout with her sidekick, Gormley (a puppy Cavalier). Katie holds an MBA in Corporate Strategy and Finance from Duke University. A proud Colgate alum, Katie is a founding chair of the Colgate Entrepreneurship Network, recipient of the Ann Yao '80 Alumni award and 2015 recipient of the Maroon Citation. *This event is co-sponsored by: BOW, Duke Technology Scholars Program, and Duke Marketing Club.